All Thumbs Reviews: HEX Performance Products: Samples, Coupons, and Demos -- Oh, My! HEX Performance Products: Samples, Coupons, and Demos -- Oh, My! It's not always pleasant on the nose to have an athlete in the house. I believe we've reached the point at which it would be better for my son's room to smell like Axe body spray. My husband and daughter do their share of sweating for their activities, as well, and even I sometimes glisten while practicing yoga. The clothes, our shoes, their equipment, my mat -- STINKEEEEEEE. "developed the first and only system designed specifically to clean and protect today’s performance gear and apparel. We’re proud to announce our Ultra+Dual Action Gear Wash, Power+ Laundry Detergent, and On Demand+ Spray and Go." A sample set is on its way to me. Disclosure: I was compensated for this post by HEX Performance in exchange for spreading the word about tomorrow's demo at Target stores in CO and GA. Tomorrow (Saturday, May 16), HEX Performance products will be demo-ed in ALL Target stores in Colorado and Georgia from 11 am – 4 pm. Free samples and $1 off coupons will be given out in store on Saturday. Ultra+ Dual Action Gear Wash: HEX Ultra+ Dual Action Gear Wash is the first and only product guaranteed to clean and protect today’s high performance gear. 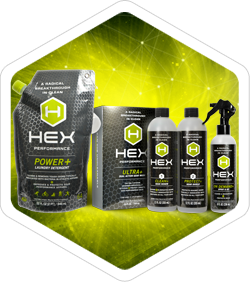 HEX chemists have created a powerful formula designed specifically for high performance gear and apparel. HEX tech will ensure your gear stays clean, protected, and odor free, giving you clean performance. Power+ Laundry Detergent: Is your performance apparel really clean? Ours wasn’t. Wash after wash,that funky smell remained. There had to be a way to restore high-performance fabrics. So we broke down the science behind sweat and created the first high performance detergent with a long-lasting odor eliminating technology, all while staying gentle on fabric and skin. HEX Power+ Laundry Detergent is also free of dyes, perfumes, and optical brighteners.....And if that wasn’t enough, HEX patent-pending technology is naturally antistatic and restores fabric wickability. This eliminates the need for dryer sheets and fabric softeners, which saves you even more time and money. On Demand+ Spray and Go. It’s the perfect on-the-go solution for protecting and maintaining your gear and footwear. With all of the amazing benefits of HEX tech crammed into a spray that you can take anywhere, from your shoes to your yoga mat, you’ll never have to worry about odor again! My nose is quite excited at the prospect HEX Performance offers. Do you have any STINKEEEEEE clothes/shoes/equipment in your home or car? Get to a CO or GA Target tomorrow! I am not aware of these products so thanks for the heads up. i will be looking for them. I bet I could use them on pet stuff too? Stink is stink?